January 23, 1951, 4:30 am: Mike is born at St. Anne’s Hospital, Chicago, Illinois, first child of James & Juliana (Judy) Rasfeld. 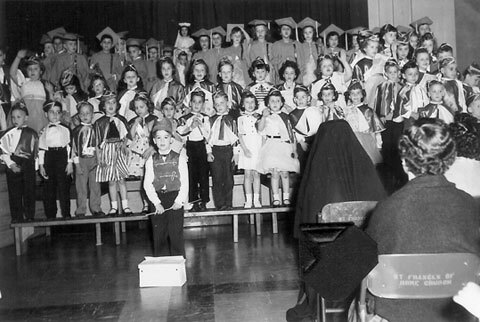 1956: St. Frances of Rome School had Kindergarten Graduation, where Michael was given the honor of being conductor for the Kindergarten music show. In his first grade class at St. Frances of Rome School in Cicero, the teacher saw him reading a 4th grade book, gave him an IQ test and decided to advance him to second grade. 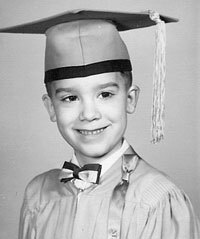 1959: In 4th grade at St. Domitilla School, Hillside, IL, Mike won a Science Award. 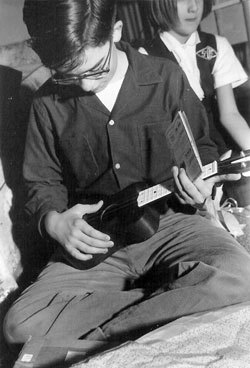 January, 1964: Mike gets a ukelele for his birthday and enjoys playing it (photo at right). June 1964: Graduated from 8th Grade, St. Domitilla, Hillside, IL. Sept.1964-June 1966: Attended St. Francis Catholic High School in Wheaton, IL. September, 1966-June, 1968: Attended Wheaton Central High School. John Belushi was a classmate of his and they were both active in the respected drama department at that school. While there, in November, 1966, he took part in various stage shows. He played Grandpa in the play “You Can’t Take It With You.” Also, in May 1967 he performed Magic at a Varsity Show. In April 1968, young people from Wheaton Central entertained at an NAACP Auxiliary Benefit Dinner and Michael was Master of Ceremonies. 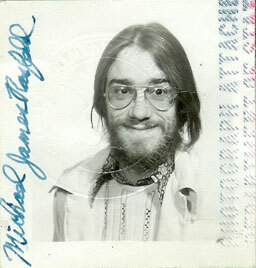 Also in April 1968, Michael, acting out a sketch from “Beyond the Fringe” and performing all of the silly British voices, wins the National Forensic League State Championship, the Tournament of Champions Comedy Championship at New Trier, and the Illinois High School Association State Championship in the category of Comedy Reading. At Graduation Ceremonies, Michael was Class Speaker for the program. His speech was entitled “Live It Like It Is”. While in high school, Mike's interest in electronics had earned him a part-time job at Charlie's TV in Wheaton. While doing a service house call to repair a woman's television, the woman opened the door to see Mike standing there, and commented "You're still wet behind the ears!" He replied, "Let me see if I can get it working again and then you can decide how wet my ears are." 1968-1969: Mike attends college at Illinois State College at Normal, Illinois on a drama scholarship. During this year, he was cast in the leading role in "The Second Shepherd's Play." His grades suffered because he spent more time in the college radio station than on academics and he dropped out after one year. Summer 1969: Mike moves back home for a short time before relocating to his grandmother's house in Austin, closer to Chicago. Fall, 1969-1972: Mike works at various interesting jobs, eventually moving to Chicago's north side and settling in the Wrigleyville area. He works as a light and sound tech at Second City. When a spot in the touring company opens up, he purportedly suggests his classmate John Belushi, who is hired and goes on to star in the main stage compnay on his way to fame in Saturday Night Live. Mike then works at EARS, a record store, where he learns a lot about the record industry and becomes an expert at all types of music. 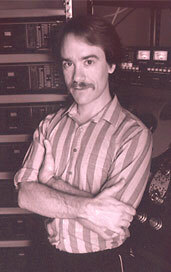 Mike also works at Paragon Recording Studio during this period, where he assists engineering with head engineer Marty Feldman. Summer 1972: Mike got a passport (see picture at left) and traveled to Europe, where he wandered around, meeting people. He bought a cheap guitar and busked on city street corners for money, and he met people and crashed at their houses. Here's a brief timeline of Mike's life. of Mike performing his award-winning comedy reading. This audio was recorded by Stacey Rasfeld during a class Mike was teaching thru Columbia College.